Krannert Center is home to many performance venues, including Stage 5, a unique location designed for both music and gathering. It’s also the home of Krannert Uncorked—the Center’s weekly gathering event that features live, local music and free wine tastings. 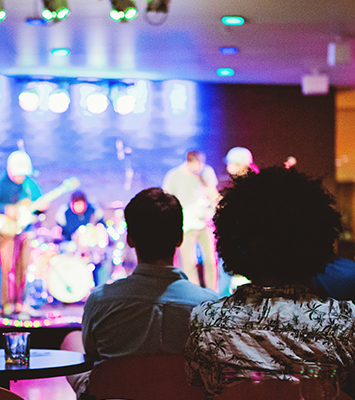 This summer, Krannert Uncorked will feature a wonderful variety of diverse music—from classic rock, soul, and musical theatre to jazz, bluegrass, and R&B. Cabaret singer Katie Flynn, accompanied by her jazz quartet, will perform on June 21. On June 28, High Cotton will blend bluegrass music with gospel-influenced harmonies. Krannert Uncorked will take a break during the week of Independence Day, with no performance on July 5. New Souls will share their signature blend of funky soul and R&B music on July 12. The July 19 performance, titled An Evening of Broadway, will feature several local vocalists, including the Center’s own Ranae Wilson, singing from the musical theatre canon. Completing the series on July 26 is guitarist Guido Sanchez-Portuguez, who is on faculty at the School of Music. Mark your calendar now to experience these free summer events!